Relationships are wonderful. Especially for the writing craft. In soap operas, all forms of togetherness are conjugated, by the same absolute-to-be-wavelength-to-up, we had twice-a-dream-common mourn. 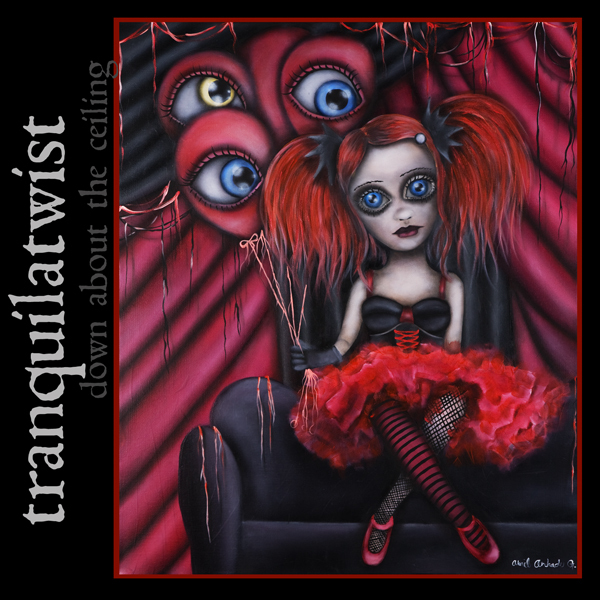 Also Tranquilatwist, a musically interesting project from New York has made in her album "Down About The Ceiling" about the different variations of the idea of coexistence. At just barely a half hour long this album is a successful debut by a band that quite knows exactly what she wants. Tranquilatwist are among those bands that pack a lot of emotion and theatricality into their pieces. Conceptually, it is Tranquilatwist close to such groups as the Dresden Dolls. However, the musical background is different. On her MySpace page singer Karlie Cary Lanni lists Portishead and Mazzy Star among others as influences for her work. In fact, the slow sound, mixed with some percussive gadgets placed close to such trip-hop bands. If you want to assemble the full explanation here, then Tranquiliatwist a volatile mix of cabaret-punk rockers like the Dresden Dolls, but much darker and more impressionistic. One could also draw parallels with Emilie Autumn, but that would probably go a little too far. It's an entertaining album certainly has many beautiful moments. "Charade" is such a beautiful song that is in an indefinable bass at its beginning, before a 3/4 beat draws a simple but effective guitar after it. Also, "Intrinsic," which begins with a trickling piano and slowly builds on an unobtrusive bass drum, strings and some electronic gadgets, like a burst of wind keeps gaining momentum. Rounding out the musical gems are dominated by the beautiful voice of the singer, while there is not exactly a recognizable, but their craft through out. The bottom line is Tranquilatwist but a promising newcomer, could perhaps also make the leap across the pond!